Episode 4 – Silence How do you look into the eyes of a God who let you down? How do you speak the thoughts that are in your mind? Wasn’t He supposed to protect us? Didn’t He promise to look out for us, to keep us safe under His wing? How then did we get caught up in this event? Why? No. It is too hard to look Him in the eyes, for then all my thoughts would be revealed, and the questions would come. Could my faith endure if I opened the flood gates? It is better to keep it hidden, locked away in the deep recesses of my mind. Just carry on… I walked those first months after 9/11 as though I was in a trance, feeling as though others led me, telling me where to go, what to do. I was afforded no consolation. My complaint remained bitter in my soul. The groaning of my heart was not adequate to express the extent of my suffering. The grief was beyond expression. I languished in my bitterness. Oh, that I knew where I might find Him, that I might come to His seat! I looked, but I could not find God. When I looked to the left, I could not see Him. When I turned to the right, He was not there. Where then could my help come from, if I could not find the place of God? (Job 23:1-3; 8-9) I was in the desert and God was silent. He did not speak to me for three months. Shunned by God. Did He really turn His back on me? It seemed that way. Is this what it is to be truly alone? I felt an empty silence that followed me everywhere I went. It was like when you speak or sing in a room with poor acoustics, the sound goes out then falls to the ground with a thud. The time between the Old and New Testaments is known as the “silent years.” During those four hundred years, God did not speak. There were no words spoken by inspired prophets. Nothing was written regarding the Israelites. We are left hanging, wondering if that is the end of the story. Waiting with our breath held, for the words have left the Israelites with empty promises whose fulfillment seemed never to be accomplished. Had God said all He had to say to prepare the way for His Son? And I wondered, why was God silent now, why had He sent me to my “silent” time? Where was the justice, where was the help? God had thrown me into this dark place and left me standing alone. I was lost and could not find my way. Yet, where was God? Though I cried out, my words fell on deaf ears and no help came, no comfort. My life is but a shadow, already it has faded. He breaks me down on every side, and I am gone; My hope He has uprooted like a tree. (Job 19:7-10) I never felt any anger, just a deep sense of disappointment. I told this to my pastor, that I felt like God let me down. 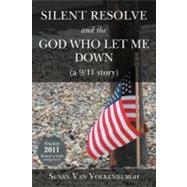 He bristled then stated, “No, God did not let you down. He did protect your father, he took him to heaven. He is in a better place.” He was earnest in his reply, but defensive. It was apparent to me that he felt I verged on sacrilege for voicing such a thought. I looked at him, hurt in my eyes and said, “But I need him here with me. I wasn’t done with him.” It was my hurt talking. But I thought, “Why do you defend God? Does God need defending? Can He not defend Himself? Does He need us to justify His ways?” Even so, He disappointed me. He let me down. That was how I felt. And all the defending and rationalizing would not change that fact. My intellect told me He didn’t, my spirit told me He didn’t, but my emotions, my hurt, my grief said He did. After all, did He not promise to protect His own? Did God not tell us in Proverbs 12:21 that “no harm befalls the righteous, but the wicked have their fill of trouble,” and in Psalm 91:11, “For He shall give His angels charge over you, to keep you in all your ways?” How then did this happen? Where was God in all of this?